Harold Wilson called The Open University(OU) ‘the greatest achievement of his Labour Government’. Almost 50 years later, the OU is now the largest university in the United Kingdom and has taught over 1.8 million students. 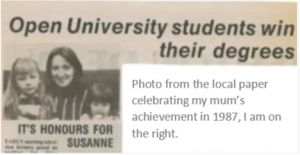 My love for the OU started when I was very young, watching my mother study for her degree (alongside working, running a home and raising two daughters). My passion for the OU led me to start working here, first in the International Development Office, then as a Research Manager in the Faculty of Arts and Social Sciences and now as a freelancer, through my own ethical consultancy firm. Key outputs on an OU project that I have been managing included the publication of two reports which I am delighted to write about today. Both reports are being launched this Wednesday, on World Access to Higher Education Day 2018, the first of its kind and one the OU is proud to be supporting. The first report was commissioned by the British Council (the lead partner on the LASER Project of which the OU is a member) and was led by the OU’s Dr Ann Hewling, a highly experienced Associate Lecturer at the OU and former employee of the British Council. The report explores online learning in tertiary education in the Middle East and North Africa (MENA). While online learning holds increasing potential for high quality learning opportunities in a region that faces challenges in serving an increasingly large youth population, there are a number of limitations; most compellingly, legal frameworks which do not allow for the recognition of online degrees. The report explores international and innovative practices in online learning, identity, assessment and security, regulatory frameworks (including recent developments in the United Kingdom, United States and New Zealand) and the potential for mobile learning, with a key focus on Egypt, Jordan and the United Arab Emirates. The second report comes from OU Scotlandand is a key output of the Refugees’ Educational Resources (RefER) project, which supports practitioners working with refugees and asylum seekers. This project was led byArt of e-Learning, directed by Gabi Witthaus and her team. She reminds us that ‘there are thousands of free informational and educational resources available online targeted at refugees and asylum seekers, and yet there is no information widely available about how these resources are being used or whether they are fit for purpose.’ The project, funded by the Higher Education Innovation Fund, was designed to address this through an evaluation of the free, online learning resources that are available to refugees in the UK, to help the OU identify how it can support gaps in resources. A number of key barriers are highlighted in the report, including cultural bias in learning materials, complex language, mobile data costs, a perception that online learning isn’t ‘real’ learning and a lack of training and opportunities for volunteers. We also share a comprehensive list of over 500 resources that are available to all. The Economist reminds us that ‘the global tertiary-enrolment ratio—the share of the student-age population at university—went up from 14% to 32% in the two decades to 2012; in that time, the number of countries with a ratio of more than half rose from five to 54. University enrolment is growing faster even than demand for that ultimate consumer good, the car.’ 50 years on, the OU remains committed to opening up educational opportunities to all by offering a flexible, blended learning approach for its students. We hope that through our latest findings, we will be able to raise awareness of many of the barriers that are stopping people from learning, both in the UK and internationally. Armed with this knowledge, we can work together, across the sector and across the globe, to ensure that access to quality education is made available for all. I know first-hand the power of the OU, as do over 1.8 million others, each with their own unique story to tell. 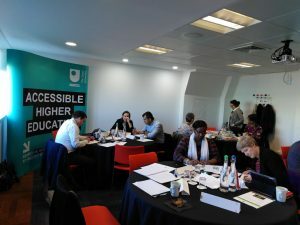 You can follow The Open University on Twitter using @OpenUniversity, @OUScotlandand @IntDev_OUand if you would like to keep updated with its work in international development, sign up to their monthly e-Newsletter.